Good quality case handle with hardware-Black Leatherette Covering----for Violin and Violia Cases and may be used on other instruments cases. Silver Colored Case Latch with Key---for Violin--Viola Cases or maybe be used on other instrument Cases. One Size only. Bow Holder--Black-- Swivel Type--Complete with Screw's. One size for all Violin/Viola cases. Small Instrument Humidifier--use for maintaining your instrument's humidity level is essential to preserve its playability, sound and integrity. Protects against dryness that might cause cracks. warping and shrinkage. It releases moisture slowly and evenly inside your instrument case. Wet the sponge when needed. Size 5/8 inches thick X 2 inches Wide and 2 3/4 inches long. To be used inside the instrument case. Schatten Volume Control: The Black Box is a small lightweight passive volume control unit that simply plugs into the endpin jack or output jack of your Guitar. It is designed to work with virtually any acoustic instrument that has a pickup system that lacks volume control. Size: 2 1/4 inch X 1 1/4 inch X3/4 inch. Weight 1 1/2 oz (42 Grams) Extremely rugged. Works flawlessly with virtually any preamped pickup system. It may not work properly with some older low output, passive pickups. Schatten Pickup for Mandolin--Adheres to back side of adjustable bridge ( not included ) with small amount of special putty (included). Side mount 1/4 inch jack --no volume control. Very easy to install. Same pick up as No. 217E--However, Side Mounted 1/4 inch Jack with thumbwheel volume control. 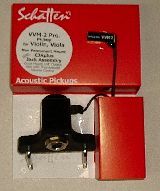 Schatten Violin Pick up---WITH Volume Control--Adheres to left side of Bridge (Bridge not included) with a small amount of putty-included. 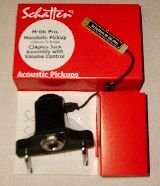 ( Non Permanent Mount---Very easy to install and may taken off and used on another violin when needed.. Side mount Jack with volume control thumb wheel. Full side Violin 4/4. Instructions included. Schatten Violin Built In the Bridge Pickup with Volume Control. This pickup offers unparalleled reproduction, range and clarity of sound all wrapped up in a high quality medium density bridge. There is no false fatness of sound to the series of pickups; they will give you everything your violin has. Response is sweet from the bottom end right up to the top. It is installed into a high quality Despiau Maple Bridge. This pickup has excellent volume, great bottom and mids and even response. Needs to be installed by someone that understands installing Violin Bridges. Once Bridge is cut for fitting there is no return policy. Complete with side mount Jack with Volume control wheel. Violin full size 4/4. Ten feet--Right Angle Instrument Cable by Planet Waves--Good quality with extra clean signal and low compacitance..standard size 1/4 inch jack. On sale till end of stock. By Planet Waves: Classic series microphone cable--XLR male to XLR female. Nickle plated brass connectors, corrosion resistant. Heavy duty, plated copper-braided shield. Length 25 feet. Mic to Soundboard. on sale till end of stock. Built into bridge for the finest sound. Bridge must be fitted to violin. Hand-made in Canada, sold world-wide. A favorite of many world renowned performers. Violin Full Size 4/4. Does not inclued Side Jack Assy. Schatten 1/4" jack assembly. Attaches to side of violin--use with # 221E Schatten Pick-up. Violin full size 4/4. Without Volume Control. 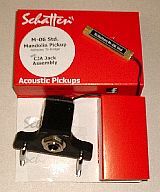 Schatten 1/4 inch Jack Assembly Only--WITH Volume Control, Violin 4/4 full size. Side Mount, Use with Pick-up # 221E. Planet Waves Coaxial Instrument Cables. Patented nickel-plated plugs with patented compression springs ensure positive connection. Extra clean signal and low capacitance, great for violin pick-ups. 1/4 inch jack, 10 feet in length--Excellent Quality. Sale till end of stock. Muco Violin Shoulder Rest --Well made shoulder rest with moulded body and Foam Cushion, Rubberized feet, fixed legs, adjustable in height and width. Violin Full Size 4/4. Retail $26.80 . Stannton Violin Shoulder Rest--Violin full size 4/4. The European Classic shoulder rest has been designed to take advantage of the natural acoustical properties of wood. Many rest hinder the sound of an instrument by damping the violins vibrations. This rest will actually enhance the resonating ability of the violin. Very Nice Wooden Rest with metal end members with moulded Rubber adjustable feet. The flamed maple wood provides transparent vibration from instrument to shoulder rest and the patented 2 resonant holes on the body structure improve the acoustics. Folds down as shown in photo for easy case storage. Violin full size 4/4. 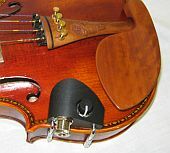 Anton Breton Violin Shoulder Rest--Adjustable Foot Design for Height, Width and Angle. -Violin Size 4/4--3/4. Complete Set---- for both ends---- of 2 End Members (moulded feet complete with brackets) for Item # SR 700 Anton Breton Shoulder Rest. Violin 3/4--4/4 and 1/4--1/2. In Stock Now. New: Eclipse Tuner by D'Addario. Affordable no longer means compromise. The New modestly priced tuner with unparalleled performance. Chromatic Clip on tuner offers fast, accurate chromatic tuning on and off the stage. Features a full color vertical display, auto power off, and pitch calibration in a compact design. Multi-swivel action allows for the perfect viewing angle. Can be mounted in front of or behind the head stock on right and left handed instruments. Can be used on many different instruments: Note: Colors: Yellow--Purple--Black. The dual-swivel clip-on allows for virtually any positioning on most instruments. 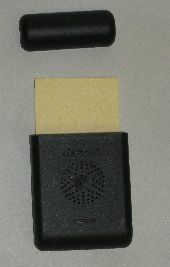 Visual Metronome, Wide Calibration range 410-480Hz. Reversible multi-color display. A compact, convenient and accurate tuner for every instrument in your collection. Padded mount fits most standard Violins & Violas, Visual Metronome, Multi-Color Display, Easy to use non-marring leaver-lock clamp. The precision violin tuner is not only perfect for tuning, the unique mounting system and fast pitch response allow it to be used as an effective practice tool for improving intonation while playing. While in tuning mode, press either arrow to adjust tuner calibration from 410 t0 480HZ. While in Metronome mode, press either arrow to adjust tempo setting from 20 to 270 bpm. Clip on Tuner by Intelli---Picks up vibrations directly, blacklight illuminates a LCD panel in dark places, Quadra flat tuning--no need to remove capo to tune guitar, Automatic power off--3 mins no signal, Calibrate from 430 to 449 Hz, May be used on various instruments, compact--folding, fits in palm of hand. Our Best Seller.